“International Conference on Solar Energy for Buildings and Industry” ISES, AEDES and the University of the Balearic Islands are pleased to announce the 2016 edition of EuroSun, the ISES European solar energy congress. Thermal demands on buildings and industrial processes account for one of the largest energy consumptions worldwide. As the energy supply chain shifts to a more sustainable model, a number of issues arise, such as “What would be the future energy mix for those sectors?”, “Would in-situ energy production take a significant share of that mix?”, or “How will the variability of the renewable sources be managed? “ In any case, solar energy, in any of its forms, is called to play a key role in the future supply of such demands. With a quickly evolving market, options that just ten years ago were regarded as non-feasible, like the use of PV for thermal applications, the construction of net zero energy buildings, the operation of solar district heating networks or the generalized use of solar energy for industrial processes are now regarded as promising options under different phases of development. That creates new opportunities, for example the important developments of the Concentrated Solar Power industry may now find new applications in the process heat market. But it also creates new challenges like the requirement to develop safe & cost effective storage systems at different temperature levels and the need to define standards, testing procedures, and application guidelines that cover the new, as well as the more consolidated technologies. This ever changing panorama presents a challenge for the scientists and engineers working in the solar field, and to the teaching community, because they should constantly be aware of the changing environment to be able to provide meaningful contributions to the advancement of Solar Energy. 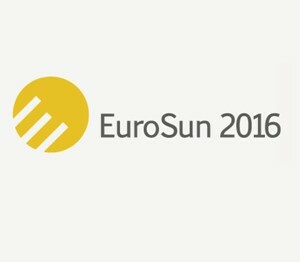 EuroSun 2016 will be a unique platform to discuss the latest developments with leading solar energy specialists as well as policy makers and industry representatives. The congress will host topic sessions, keynote speakers, plenary sessions and open discussion forums, as well as social events where you will have the opportunity to network, to meet old friends and to make new contacts. Everything in the unique environment Mallorca offers to its visitors.